Most of the salesperson complain about one common problem and that is: even after spending years in the retail industry, various elements ranging from consulting, sales to marketing; everything is as complicated as it can be. Despite of the hard-work and efforts, the performance seems to be moving nowhere. So, where does the issue lie? 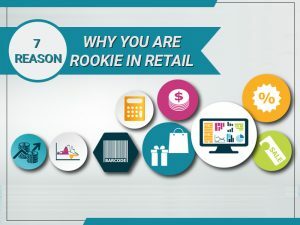 To help out, here we reveal the 7 best kept reasons from hat differentiate a rookie form a successful professional in retail. Whenever a client approaches you to know more about the potential options that you have in store for them, what do you do? Well, rookies tend to offer their clients with a myriad of options and this confuses the customer to a greater extent. What people fail to realise is that a confused client can never be transformed into a buying customer. Sales representatives believe that it is the client who always has to make the first move. They will come to the professional only if they are interested in purchasing. Well, that’s absolutely wrong! You have to approach every customer who comes to you. Though some of them might reply that they are only looking, however their presence itself is a reflection that they are not sure whether they must buy or not. Though clients are regarded to be the ultimate decision maker, it’s your job to make them realise that they take an ideal step. The point is you should never sell the products to a wrong person, especially when there are other potential options available for them. Rookies have a typical tendency of selling to each and every customer who made their move, because they think that if they lose even a single opportunity then they might even lose the chance to hit the main sale. But, things don’t really work that way; focus and master on selling skills and ensure that you come up with 100% efforts from your side. Think about the last time when you were told that something went wrong, what exactly was your reply? Did you accept your fault and learned from it or just kept on providing excuse stating you had no role to play in it. Taking the responsibility or escaping from it, well that’s the difference between a professional and rookie. Once a wise man told, its nothing hard in retail. Its just a hard work. Many sales training companies now offer high quality retail sales training programs. Rookies formulate lies that are too good to be true in order to have a competitive edge over others. Though this might help you gain momentum in your game but ultimately it leads to utter failure and keeps you where you are. Never count the commissions unless they have been given to you. Because the bonus is yours only when it has been deposited in your account, before that just keep selling! This entry was posted in Leadership and tagged leadership training, sales leadership course by B-More Consulting. Bookmark the permalink.